At 6:50 a.m. Monday morning, I climbed aboard Amtrak 711, destination Richmond, on the way to my El Cerrito piano studio in the East Bay. The weekly trip north was a welcome breather from the tedium of Fresno’s blazing hot sun, 90 degree plus temps into the fall season, and an insalubrious haze over the city. The good news was that once comfortably seated on the train, I completely forgot the Central Valley and looked forward to a ride with my two traveling buddies, Jim and Jose. Jim, nearing 60, had a cherubic face and an impish smile. A repository of information, he was a web consultant for a well known, top of the line retailer. Often, during the course of our trip, he excused himself for a couple of minutes to complete a status report, or to reply to his boss via instant message. A hearty fellow with an engineering background and flair for technology, he came equipped with an iPhone and a state of the art Toshiba lap top. If you asked Jim any technical or scientific question, he was an amazing compendium of information, like a traveling Wikipedia. One time, Jose asked Jim about microwave cooking and if the rays negatively affected a food’s nutritional value, to which Jim gave him a symposium on ionizing radiation and various levels from safe to unsafe, etc. It was equal to a Physics lecture given at an ivy league college. Jim also liked to banter about the economy. He dispensed his meticulously detailed descriptions of the financial market, speckled with raw data that would add brain convolutions to novices like myself. If Jim got going on California’s economy, he’d advise residents to bail out and run like the dickens to another state. Jose was a good listener. An economist in his 40s, originally from Venezuela, he worked for a spice company in Northern California. His stay on Amtrak was briefer than Jim’s since he departed at Stockton and took an awaiting bus to Sacramento. I enjoyed Jose’s international political perspective and his analysis of countries that had stable as well as failing economies. He could be as convincing as Jim in his own area of expertise. I sat comfortably beside my two traveling companions offering a totally different perspective on life and the cosmos. 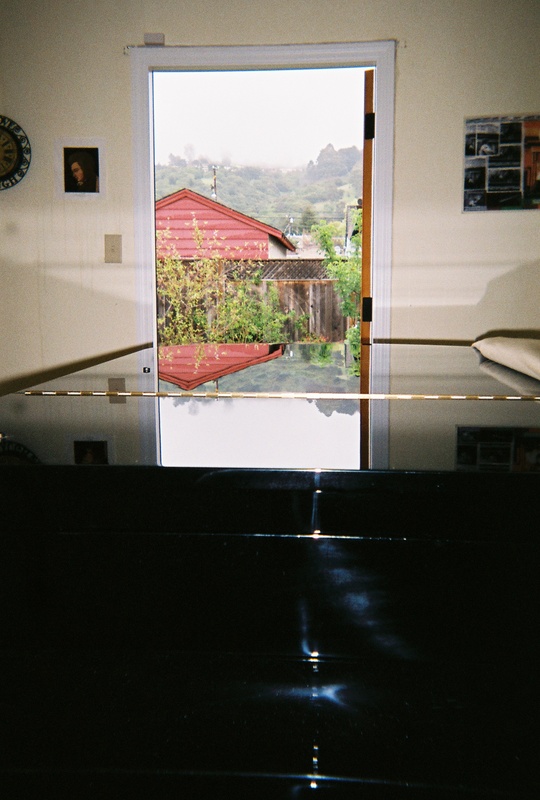 I imparted the artistic side of life: a universe of practicing, teaching, and recording. Jose had informed us that he was going to Paris on business the following Monday and wouldn’t be back on Board Amtrak 711 for two weeks. I felt of a twinge of disappointment because our table would be whittled down to two. I departed the train at the Richmond station where I hopped over to Bart, going one stop to El Cerrito Del Norte. My studio, within walking distance, was about half way up into the El Cerrito Hills. Homes at the very top overlooked the Bay and Golden Gate Bridge. From my more modest studio, well below the peak, I still appreciated a breathtaking landscape as beautiful as a painting with hills and terraced homes. Before I had officially started lessons in the early afternoon I always took a scenic, steep walk into these very same hills, and then wound my way down to the Ohlone walk way under Bart on my way to the El Cerrito Library. An hour later, after a stop at Subway for a veggie burger I would meander back to the studio for a lesson plan review. My Bay area students were mostly kids at beginning and intermediate levels. The last lesson, ending at 9 p.m. was with a retired business professional who has an affinity for world wide travel. An eager learner she practiced intensely when she could, though her time at the piano was sparing. The pieces I’d been teaching up north were Minuets and Sonatinas from the Classical era; a Baroque Rondeau, and some ragtime music by Scott Joplin. The beginners were journeying happily through their Primer Faber Piano Adventures learning the basic symbols and notation of music while the older students enjoyed the works of Bach, Rameau, Mozart, and Latour, a classical era composer. When lessons were over well past 9 p.m. I had set my alarm clock for a Tuesday departure, regretting the trip back to Fresno where I would be greeted by stifling heat. The ride home would also feel longer without Jim and Jose, as companions. But there was always the chance I would run into someone to strike up a conversation with. And it happened. As I sat in the dining car munching on a fruit and nut bar, I overheard a woman chatting about her self made “guitar” earrings. I soon learned that she had hand crafted her adornments from guitar picks, painted them and added some fancy attachments. Before long, I began telling her about myself and the piano and she, in turn, shared her life story. The journey home was definitely quicker than expected. Before I knew it, I was back in Fresno, with four students on the roster for the late afternoon. Since a few were preparing for an October 30th recital, I thought about you tubing performances as practice motivators. Kabalevky’s “Clowns,” would be a great shoot. A very colorful, short programmatic piece with a circus like backdrop, it had droll harmonies and appealing dissonances. The next few weeks would be packed with rehearsals, which made life a nice, creative adventure. Previous postThe You Tube thing!